NEW! Transport your favorite craft or micro-brew beers in style with these classy, easy-to-make carriers. Paint them to match your favorite college or professional team colors then decorate them with eye-catching decals. 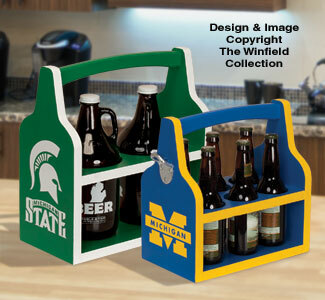 Patterns and instructions are included to make both the Beer Bottle Caddy and the Beer Growler Caddy pictured. (up to 14" long). Note our Michigan/Michigan State Decals are not included with the pattern.